My 2016 trip was a success. I was mostly not in Kathmandu Valley, travelling first to Pokhara then nine weeks in Terai. I have a yinyang relationship with the Terai; I love the people there but the climate is difficult. It was – hot! I am back in USA trying to figure out how to advance the overall goals of CCNEPal. Stay tuned! Today, May 29th, 2015 is my last full day in Nepal, after having come here May 26th, 2014. I have loved every minute of it. I even loved the parts I hated. People have been wonderful to me, here and again I felt that I was riding a surge of positive energy as I carried out my project – the path was cleared for me by so many people eager to learn new techniques and do the best they can to serve the patients. I’ll go back to USA and try to be “normal” again. Whatever that is. First, I’ll be in Maine. From there? stay tuned! The medallion is solid gold of course. and the jewels? real diamonds, rubies, sapphires and emeralds. 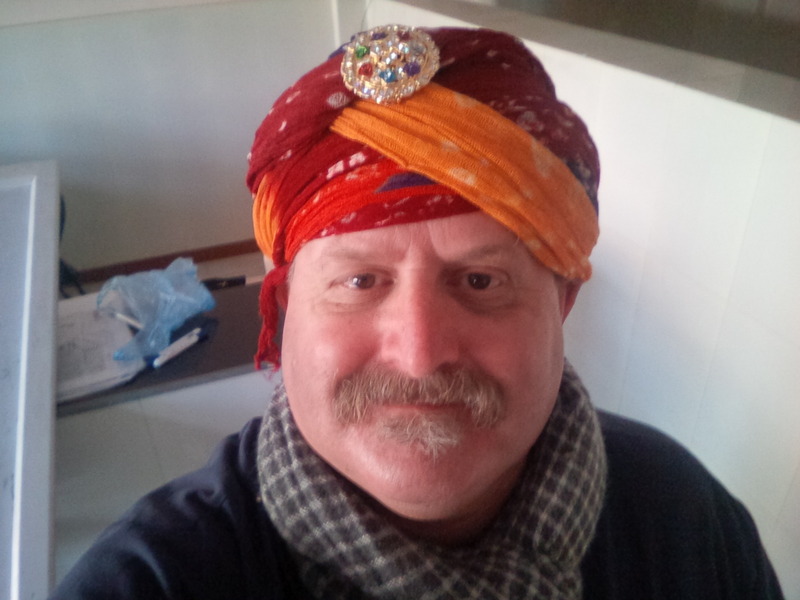 to wear the puggri with the medallion imparts the guru with th eability to jump out of linear time – travelling through the past and future at will – um, that would be me…. 2014-2015 is my sixth and seventh trip to teach nursing in Nepal. In summer 2007, 2008 and 2009 I taught at Tansen Nursing School, which is considered to be among the best nursing schools in that country. I have fifteen years of ICU nursing background. I am a former “ACLS-I” – certified to teach Advanced Cardiac Life Support by the American Heart Association (lapsed) as well as a former Regional Faculty. Because of the need to recertify, I decided to let the official cards lapse in 2003. I have the skill in my head and I keep updated, whether I possess the card or not……. Here in USA I have taught ICU nurses since 1980. Though I enjoyed working with the newbie students at TNS I did not feel I was using my skills to the best of my ability. Still and all, I got the chance to be up close and personal with the day-to-day bedside practice of nursing, especially the way that Nepal nurses respond to emergencies. In Tansen on a slow day I took to running emergency drills similar to what a USA nurse would be taught, but which is not a standard part of the PCL curriculum in Nepal. I wrote a nonfiction book about my first summer in Tansen. In 2010, instead of going to Nepal I did a 450-mile backpacking trip on the Appalachian trail to accompany my daughter, who was through-hiking the whole thing. I had a lot of time to think about Nepal. In summer of 2011 I returned to Nepal, but instead of going to Tansen I decided I would focus specifically on teaching critical care response skills, and not limit myself to being part of a structured curriculum organized by other persons. I worked with Lalitpur Nursing Campus to launch this program. If you go to YouTube you can see a 24-minute video of the class filmed by a professional videographer. I trained 190 nurses from more than fifteen hospitals and a dozen different schools of nursing, and got an enthusiastic response. Go to the archive of this blog, and pick a random entry from summer 2011. You will find details entries that describe the whole summer progress. I used my experiences from Tansen to design something that would appeal to Nepal nurses, and people seemed to relate. Go to my youtube channel and rummage around. I did another 300+ miles on the A.T. in 2012. then began planning or summer 2013. Oh, and I also have been working on my second book about health care in Nepal. It is titled The Sacrament of the Goddess and was published in the USA on May 1 2014. I will get it published here in Nepal soon. Buy it on Amazon. 2013 I kept all the contact info from people who took my training in 2011 and I built upon that work. A detailed report can be found here. I trained 534 people. I also used a FaceBook page for the 2013 project. I thank everyone who was involved. Together, I think we made a difference. I made a proposal to the University to allow me more time here in Nepal, and they accepted. This time around I arrived in May 2014 and will stay until May 2015. In 2014, the critical care skills program is having enough time to make an even bigger impact. CCNEPal awarded 708 certificates in 2014, in 28 batches. In Nepal, large numbers of people didn’t have any idea what ACLS was, let alone whether they should take it or how to be better at it. I am working on that. I’m back from India, and thoroughly enjoying Nepal. I’m teaching again, and I consulted with the people that set up the first officially-certified AHA International Training Center. Plans are in the works for me to be designated as a Visiting Faculty Member for one of the Nepali Universities, an honor I will cherish if it comes to pass. ( I will name names when the time comes). I love what I do, but the goal is to advance nursing practice here in Nepal, not to simply have fun (no matter how much I like to draw attention to myself). If there is a better way to advance the practice than what I employed, I will try to adopt it. In the meantime, I find that I am one of the few persons who tries to describe Nepali health care to the western world. I don’t pretend I am an expert but I do think that there is an information gap between people in Nepal and well-meaning people elsewhere who don’t know where to begin. I maintain a strong web presence for the purpose of educating westerners (“videshis!”) on the topic. I also work hard to present the nurse’s perspective. We need to not focus only on the (male) doctors. I strongly believe that empowering women is the key. The Sacrament of the Goddess, my second book, is being published in Nepal in January 2015. I will answer questions via email. Send suggested topics to joeniemczura@gmail.com and I will respond. There is a FaceBook page to describe my prior trips to Nepal, The Hospital at the End of the World (my first book). On Amazon you can read reviews of that book, and buy it too! Joe, thanks for your ongoing commitment to fine medical care! I believe you are making a difference to many! Nice to meet you via Writer Unboxed! And a fellow traveler! I traveled into the Mongolian countryside for a couple of years teaching border officers how to use radiation detection equipment installed there by the US government. Funny how traveling to places like that can leave you so fond of the country and the people and at the same time so grateful for life here at home! I particularly appreciate your perspective on empowering women. I agree – it’s very important. We were surprised to find in Mongolia how many of the officers were women – usually more than half. We learned after a while it was because Mongolian families send their boys to work, and their girls to school. It doesn’t take long before the girls have an economic and employment advantage. It will be interesting to see how the imbalance gets handled over time. I can think of no better person to be in this role. Joe has a kind and playful spirit that resonates in his teaching style. Joe, you are a dedicated and conscientious professional. Thank you for all you do!